Here at Granite 4 Less we believe that you should not need a fortune to have a great looking home. We do our best to bring the best we can find for the best prices we can offer. Granite is a great addition to any home, check out our selection here, our staff will help you find your dream home. Quartz can add a natural touch, a great alternative to quartz for your own personal style, browse our varied selection. Marble counter top surfaces are timeless with their classic beauty and elegance. The cool to touch presence can really revitalize your home. 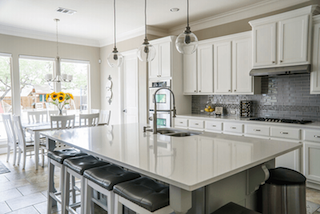 Granite countertops don’t d­epreciate in value. Sanitary (Non-Porous) — bacterial contamination is not a problem with granite. 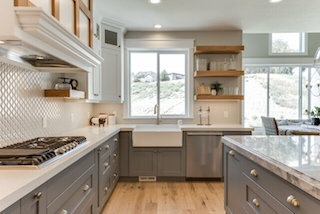 One of the most active areas in a kitchen is the counter top. This is why it is important to choose the right materials that can hold up to whatever the kitchen can throw at it. Currently, manufacturers develop counters of both natural and synthetic materials that perfectly meet all requirements and also offer a variety of finishes and colors. We offer affordable stones and have a huge selection of granite and quartz from quality manufacturers. We specialize in granite counter top fabrication and installation services. With a great selection of unique colors and stone types to choose from, you will be able to find the perfect counter top for your home. We work hard to complete your job on time and within your budget. A new granite fireplace will add beauty to your home. Discuss your ideas with us and our team will turn your dream into reality. Nate and his team are excellent to work with – flexible and very professional. Their work was excellent and saved me time, money and headache. Nate rocked our granite counter tops! He was always prompt and did exactly what he said he would do. He installed new counter tops in our kitchen and 3 bathrooms. He offered excellent advice, answered our questions, and was very patient with our process, which was delayed a couple of times due to our cabinets not being ready. The counter tops turned out beautifully and we couldn’t be more pleased. 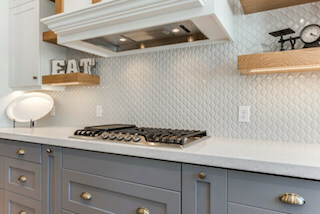 Our new countertops are just stunning!! I should have done this a long time ago and then the wife finally pushed me to pull the trigger and I’m now glad she did! Thanks G4L!